The Barony A Frame, an iconic former colliery site in East Ayrshire, has hosted a brilliant celebration of art, created by local school pupils. Using the A Frame and mining legacy as an inspiration, the pupils were asked to come up with a series of artworks – and the results were spectacular! Giant carved canaries, colourful drawings, stepping stones and panels of creative mosaics were proudly on display, as Barney Menzies, Chair of the Barony A Frame Trust welcomed pupils, teachers, parents and Council officers to the site. Officially opening the event, Mr Menzies said: “There’s hardly a pupil in this area who doesn’t have a connection with mining, so it’s important to us that they learn about their heritage and take part in the work of the Trust. During the last two years the Trust has been working with local pupils giving talks, helping with research and providing resources, inspiring them to produce a range of art and other artistic works, linked to mining and the A Frame. 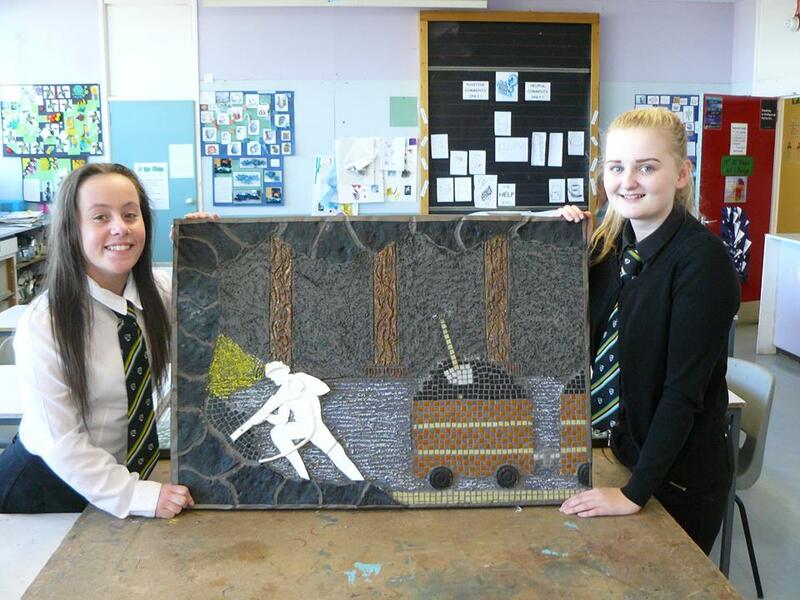 Nicole Brown, a senior pupil at Auchineck Academy said: “When designing the mosaic I learned a lot more about our local history and how mining has played a huge part in it. Alan Ward, East Ayrshire Council’s Head of Education added: “Working with the Barony A Frame Trust has helped pupils make new and significant connections with the local community and broadened their academic horizons through inter-disciplinary working. It’s been a very successful collaboration. A further, welcome development for the Trust was the development of an App, written and recorded by pupils, offering a spoken, guided tour of the site and information on points of interest. The free App weaves together recordings of the pupils’ script with reminiscences from people who once worked at the Barony Colliery. Mr Menzies added: “The App is a great addition to what we’ve achieved with the project and uses technology and software to best effect in promoting and enhancing what we have to offer at the Barony A Frame. “The App and the art have far exceeded our expectations and with the passion and interest being shown by our next generation, I’m confident the Barony A Frame has a long and secure future ahead of it. Please visit our Gallery page to view pupils working tirelessly on this project.